Epson WorkForce 323 requires voltage levels of AC 120 V (50/60 Hz). During sleep mode, the unit consumes 0.2 watt of power. During operation, it consumes 10 watt. It has a maximum printing resolution of 5760 x 1440 dpi for both black and white and color printing. The unit works at the speed of 4.3 images per minute for black and white and 2.2 images per minute for color. The unit uses 4-cartridge configuration, each for black, yellow, magenta, and cyan. 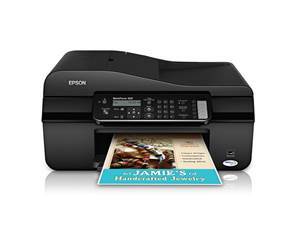 The ink used by the printer is of Epson DURABrite Ultra type while its inkjet technology is of Epson Micro Piezo. Epson WorkForce 323 comes with a bundle of software that includes Epson Easy Photo Print, EPSON Scan, and ABBYY FineReader. It is compatible with operating systems such as MS Windows XP, MS Windows 7, Apple Mac OS X 10.6.x, Apple Mac OS X 10.4.11, Apple Mac OS X 10.5.8, MS Windows Vista, and MS Windows XP 64 bit Edition. Epson WorkForce 323 also comes with a scanner that uses a CIS element. Its maximum optical resolution is 1200 x 2400 dpi, which can be interpolated to 9600 x 9600 dpi. Its fax machine is Super G3-compatible and its maximum transmission speed is 33.6 kbps.